Is this the perfect asset allocation? No. The White Coat Investor has identified 150 other asset allocations that are “better than yours“, although I think mine is definitely better than some of them. The only way to know, of course, is to look back at some future date and determine which portfolio performed the best. We could look in the rearview mirror and backtest a bunch of portfolios, but as we all know, past performance does not predict future results. How did the portfolio perform in 2017? Unlike last year, we didn’t top the reported returns for the S&P 500, but our returns weren’t too far off. Our portfolio returned just over 18% in 2017. I’ll gladly take that any year. The Rule of 72 tells me that my investments would double in four years with steady returns of 18%. I read a couple books, spent some time exploring Bogleheads and WCI, and determined my risk tolerance. Vanguard has a simple risk tolerance questionnaire that takes a couple minutes to complete. Researching for this post, I played around with it a little bit and couldn’t actually come up with a 90 /10 stock bond recommendation. I’m not sure that outcome is even in the algorithm. I usually got 100% stock or 80 / 20 or 70 / 30 depending on when I said I would start taking the money from my investments. The majority of my portfolio is invested in US stocks. I like stocks for the returns, which have delivered an average of about 10% a year for a very long time. Small and value stocks are favored by people smarter than me for potentially higher returns, so I tilt a bit that way. I have international stocks for diversification. I overweight emerging markets for the same reason I tilt to small value. Experts with much more experience than me recommend anywhere from 0% to 50% or more of your stock portion be international. I’ve gone with a nice round number in the middle. REIT funds are considered part of the stock portion, but provide some additional diversity. High volatility has been rewarded with solid returns, particularly if you look back more than 10 years. That says nothing about the future, but real estate will always be required by businesses and people. Bonds are there as a safe haven and diversifier. If we experience a downturn worse than the Great Depression, I should have something left. I doubt that will happen, but I feel better having a small bond allocation than none at all. The taxable account has US stocks and International stocks. I tax loss harvest from this account, so the particular fund(s) used will vary as I exchange from one fund to a similar fund. The Roth accounts have my small-cap and mid-cap value stocks, emerging markets, and REIT. The REIT fund is not very tax efficient, so this is a good place for it. You might wonder how I have such a large percentage in the Roth IRA. Back in 2010, I converted pretty much all my retirement savings, which was in a SEP-IRA to Roth. In hindsight, it was probably not the smartest move, but the prevailing thought at the time was that the window to make a conversion would only be open to high earners for one year. The window never closed, and I paid 6 figures in extra income tax by making the conversion when I did. Live and learn. I keep bonds in the 401(k). A total bond fund is not particularly tax efficient, so this is a good place for my bonds. After I retire, I anticipate rolling this over to a traditional IRA, and likely doing some Roth conversions. Whatever hasn’t been converted when I turn 70 will be subject to RMDs, so I also like bonds here for the likely lower long-term return. The 457(b) has small-caps and mid-caps. Since I tax loss harvest in the taxable account, I avoid keeping identical funds here or anywhere else in the portfolio. Automatic investment and reinvestment of dividends could trigger a wash sale. The 457(b) fund will start paying out the year after I retire. I will eventually put some bonds in here since this will be part of the portfolio that I will be spending from in early retirement. Nearly all funds are with Vanguard. The portfolio consists entirely of mutual funds and a bit of cash. I could also use ETFs, which are very similar to mutual funds, but trade a bit differently. My mutual funds are passive, index funds. There is no active management in these funds, and each passive fund tracks an established index. This keeps fees low, and it’s not common for an actively traded fund to consistently outperform the index. I’ve chosen a rather aggressive allocation. Increasing risk increases potential reward. I know from experience (that ugly 2008) that I’ve got the mental fortitude to watch my accounts lose half their value and not sweat it. Those accounts have bounced back nicely and I was buying on the way down and on the recovery upswing. My goal is to have > 36 years of anticipated expenses saved up before actually retiring; this is considerably more than the 25 years worth often cited as required to be FI (financially independent) and RE (retire early) and allows for a withdrawal rate of less than 3%. I like to call this financial freedom, which a level up from financial independence. There seem to be two schools of thought as to how to invest an oversized nest egg. Some would say, “You’ve won the game. Why keep playing?” Put that money in a very safe portfolio and you’ll never run out. You could go with a conservative portfolio of 80% bonds / fixed income and coast. Quitting is not my style. My plan is to hold about 5 years worth of expenses in bonds. Assuming I still have my site, I can also count on an income stream from it, which is a nice bonus I didn’t necessarily anticipate when I first wrote this post. With the remaining funds, I can be as aggressive as I wanna be. I’m not saying that I’m putting half my portfolio into Malaysian microcaps. I just don’t have a good enough reason to play it safe with this half of the portfolio. It’s a cushion that I would love to see grow, but if it dropped in half it wouldn’t phase me or affect my long-term plans whatsoever. It’s also money that I may not touch for a very long time, if ever, and if the market does tank, I’ll have time to allow it to recover while spending from the bond portion. Does this plan expose me to unnecessary risk? I suppose, although a diversified portfolio of index funds is light-years away from the riskiest way to invest a big pile of money. So why would I choose stocks over bonds for the overflow portion of my retirement portfolio? Because I can. Because I’m a man who like to compete and win. 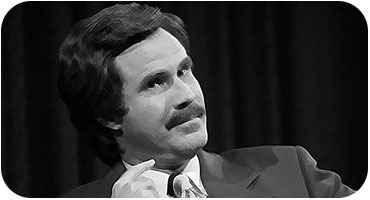 Like Ron Burgundy. I’m willing to take the slight risk that my accounts could lose value and never recover in order to reap the benefits of the much more likely outcome of continued growth that outpaces both bond returns and inflation. I’m not interested in working until I’ve amassed an 8-figure portfolio, but I’d be lying if I told you I don’t like the idea of maybe having one someday. If it happens, I’d prefer to let the portfolio do the heavy lifting for me. What do you think of the PoF portfolio? Is it a PoS portfolio, or something you could live with as your own? I’m open to advice and criticism and I would expect nothing less from my friends on the internet. Sound off below! Love the post and your website PoF! I just bookmarked it and will surely return often. My AA is remarkably similar to yours, with some minor variation. Curious on how you settled on such a relatively large emerging market tilt on the international equity side of your portfolio. Good for you to stick with it over the last several years. Do you sometimes think that VEMAX is too heavily weighted towards China/Taiwan to be well diversified. I guess you’re not a subscriber to muni bonds in taxable over bonds in tax-deferred like I am. I guess when you only hold 10-15%), you’re overall REIT exposure is likely much higher than 10%, but I like that too. Most of my retirement savings is in tax-deferred 401k/PSP/DB plan. I was not as savvy or smart as you in 2010 and did not do any Roth conversions (for better or for worse). I now hope to play the Roth Conversion horesrace/ladder game from retirement date until age 70/SS/forced RMDs, if health, luck, and tax code co-operates! With any luck I can convert over several million at an effective tax rate at or below 20%. We shall see. Thanks for the kind words, TheGipper! I’ve gone with a high EM allocation (10% overall) for the higher potential return. I’m not exactly risk averse. I have no idea if Chinese / Taiwanese stocks are weighted too heavily, but they have taken a beating lately. I’m a little over my target allocation because I tax loss harvested from Vanguard Developed Markets (0 EM) to FTSE All-World Ex-US, which has 14% EM. If I lived in a state that had a state specific Vanguard muni fund, I might have some in taxable. I’m not opposed to the idea of munis in taxable, and I’ve read WCI’s argument for bonds in taxable, but I’m not sure the math would work out in a higher interest rate environment. I can buy Vanguard Total Bond at an institutional expense ratio in my tax deferred, so there it goes. The Roth conversion ladder is a great way to fund an early retirement. I don’t think my mega Roth conversion was smart or savvy, but at least I did it when living in a lower tax state and before the additional ACA taxes took effect. I haven’t crunched the numbers, but it would make for an interesting post to analyze the repercussions of that decision. I’ll probably end up looking like a stupid dummy. I guess you’re not a subscriber to muni bonds in taxable over bonds in tax-deferred. I guess when you only hold <10% in bonds, no big difference. I like you’re overall REIT exposure, but with all those Vanguard value funds (which are packed with REITs up to 15%), you're overall REIT exposure is higher than the target 10%, but I like that as well. Typo forgiven. Thanks for the tip on the Value funds. I’ve read somewhere that TSM has about 4% REIT, but I hadn’t looked into the Value funds, which apparently have considerably more. I’ve considered reducing my REIT fund allocation and making a few investments via a real estate crowdfunding site. I would keep the real estate allocation to 10%. If I do this, I’ll be sure to write about the experience. I invest in REITs. I usually check my allocation in Personal Capital to see what my true allocation is in real estate. I’ve been interested in looking into real estate crowdfunding as well but haven’t had the time. Would be interested in your thoughts if you do, particularly if it is a suitable candidate for a 1031 exchange with an existing investment rental condo. I like your portfolio. If you have the right fortitude, then it’s good for the long haul. I have about 20% in bonds right now. That’s my ammunition for when the market drops further. We don’t have as much income to invest now so I need more reserves. I assume you still have good income so 10% bond is plenty. I also like 50x expense. That’s a lot of padding, but I’m sure you’ll sleep better. Good luck on your journey. Thanks, Joe! Love your blog, by the way. I’m still in the accumulation phase, able to claim FI, but not at all ready to retire. So, yeah… a low bond allocation and target for excess funds make sense for me right now. I could probably make the 25x I’ve got now work for the long haul, but I’ll gladly work another 5 or 6 years for a good chance of doubling it. I’m pretty happy with life as it is, although I feel strongly that I will enjoy freedom when I do pull the trigger someday and call it a career. can you post your excel spreadsheet file that you use in this post so that I can import my own information to figure out my allocation in each account. It looks awesome! That’s a good idea, jk. If it were that simple, I could, but mine is custom made to reflect the number of funds I have in each account, and the actual spreadsheets has dollar amounts which I’ve obviously left out. I can think about creating a template and posting it along with the calculators. When I find time, I will see what I can do. Check back! Fantastic site POF! Have you been able to make an excel template like jk suggested above? I would love to check it out. Thanks! I’ll put it on the to do list for the next portfolio performance update. Here’s one from Doughroller that should get the job done for you, though. Good allocation! Bond yields are so low now. In the accumulation phase one should take lots of equity risk and use market corrections to scoop up more equities on the cheap. And in this day and age with low bond yields, it’s probably even wise for retirees to be (almost) all equities. I don’t see how you get close to 4% real return with a sizable bond allocation. Wow, I can tell that you really did your homework. 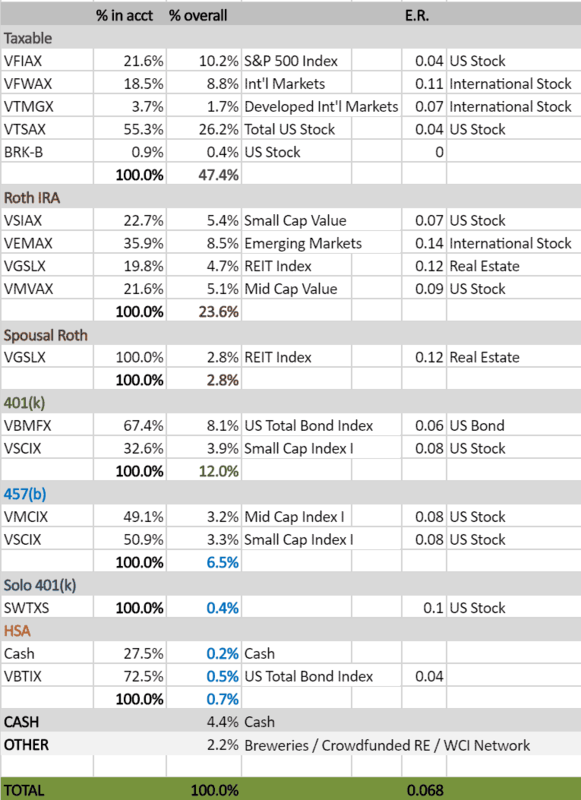 Our current asset allocation is pretty similar to yours (we don’t have it posted yet). We’re looking to build up our REITs to account for 10% of our portfolio. It’s going to take a while to build it up to that percentage since we’re putting it into our Roths and it’s only 5% now. Our bonds make up about 12% of the portfolio: 10% for U.S. Bonds and 2% for International Bonds. International stocks make up about 23% and the rest is in U.S stocks. We picked an asset allocation that works for us and are planning to stick to it. After we have 25 years worth of expenses in the portfolio we plan to continue investing any new money into physical real estate and diversify further. I like how you avoid having any total stock market or total international outside of the taxable portion to allow for tax loss harvesting. Thanks for the tip! You bet! I’ve found it’s the easiest way to avoid wash sales. Fortunately, it’s easy to swap out of funds in the tax advantaged accounts if you are currently set up in a way that you could have an issue. PoF, I love reading your updates on your portfolio. Do you use an excel spreadsheet to keep track of things? I sat down yesterday and used google docs (maybe I should do sheets instead) but it took me hours of tinkering and calculating percentages. I’m guessing you’ve got it streamlined. I’m 40 and hoping to retire in my early 50s and my portfolio is so out of whack. Reading how you rebalance is motivating, but I’m still learning and don’t use an advisor so I’m very slow to make changes. Still writing my personal investor statement but my thought is I should be ~70% stock, 20% bond, 5% REIT, 5% cash. Currently I’m 51% stock, 28% bond, 5% REIT, 1.4% gold (where does that fit? ), and 14.6% cash (lots of that cash is IN my 401k in a money market…don’t ask me why because I have no idea). Trying to figure out if 5% cash is enough (mainly need to have cash for quarterly taxes and my incessant need to do costly home projects…my major fault). Any tips from you would be much appreciated! The asset allocation you’ve outlined sounds entirely reasonable. Obviously, cash in a 401(k) isn’t doing you any good, but ready cash to cover quarterly taxes and planned expenses is important. Regarding tracking, a spreadsheet is what you want. I use Excel, but I could just as easily use Google Sheets or any other spreadsheet — they all work similarly. The beauty of a spreadsheet is that once you set up some formulas, many of the cells update themselves when you update the main numbers (i.e. value of your investments). It’s tough to make a one-size-fits-all template, but I could probably come up with a post that teaches you how to make your own spreadsheet to track your expenses. I would LOVE a post on making spreadsheets to track expenses and investments! Pingback: How I Brofited from the Brexit | Passive Income M.D. First of all, Great website!! it is definitively helpful for our new financial/retirement plan! we just finished residency and maybe starting a little late in the game wit our savings and financial plan. I just funded my traditional Ira, (2018 contribution $5500) with vanguard federal money market fund. I did the conversion to ROTH IRA and I still have the money there. I would like to allocate it somewhere else but still not sure where. Is there a reason why you have your spousal ROTH IRA (100%) with REIT index ? and yours a mixture of different ones? is there a recommended way to allocate your ROTH IRA ? or is simply based on your risk level and how you want your allocation? Not sure if these questions makes sense. I think I am still trying to figure all this out and deciding what is best to do. PoF, could you explain why you keep the emerging market fund in your Roth account? Do you expect high returns, thus don’t want the future tax bill? If I were starting the portfolio from scratch, I might own EM in taxable, but it would be difficult to make that transition without a windfall at this point. When I set up the portfolio years ago, I believe I read that emerging markets can be tax-inefficient for the reasons that jj pointed out. Advantages of holding EM in taxable would be the ability to Tax Loss Harvest a volatile asset class and the foreign tax credit (which is wasted in Roth). I may someday transition it to taxable. I’m new to investing so my question is likely common sense for those of you in the know, but I’m wondering how you can have several different funds in your Roth IRA when most, if not all, of those funds require a minimum of $3,000. It’s my understanding that the max you can contribute to a Roth IRA is $5,500, no? Per year, yes. But you can also convert IRA money to Roth and there’s no limit on that. I converted a few hundred thousand dollars from my SEP IRA in 2010 when the income limit on Roth was lifted for the first time, thinking it would be a temporarily open window in which to do so. Details in my “Mega Roth” post. I am thinking of liquidating my accounts and reallocating. I think we have too much complexity and I am not sure how to go about it. If you were starting from scratch with the following amounts of cash, how would you proceed to optimize for TLH and putting higher expected returning asset classes in ROTH, Bonds out of taxable, etc…? Below are our percentages if we liquidated today. -Spouse current job 401k- 3.3% but will grow rapidly. Will be maxed each year (56k) so will grow rapidly as percent of portfiolio. VTSAX and VSMAX are only Vanguard options. Mostly target date funds as options. -Taxable Brokerage- 2.6% -We plan to start getting aggressive here and growing this in coming years. -Two 529s for our kids which are currently not included in the percentages, but are in age balanced vanguard Utah funds. I started to try to figure this out, but got lost pretty quickly. I want to optimize for TLH without wash sale problems, move highest expected returning equities into ROTHs and anything else that I haven’t thought of. Another side question is about the DAF allocation. We have a decent chunk in the DAF, but plan to give a lot each year, but to fund at least what we give each year in distributions. So we could think of investing some of this for the long run.